"White chocolate chip pancakes are served warm with regular syrup and fresh berry syrup. Toss on some sliced fruit and a few more chips if you like!" Whisk together 2 cups of the pancake & waffle mix along with 1 1/2 cups of water, according to the package's instructions. Stir in the white chocolate chips. Heat a greased pan or grilled to medium heat, when hot pour about 1/3 cup of batter for each pancake. Flip and repeat until the remaining batter is gone. Meanwhile, in a small saucepan, combine the blueberries, raspberries, strawberries, water and sugar. Bring mixture to a boil, then reduce heat to medium-low and simmer for about 10 minutes. 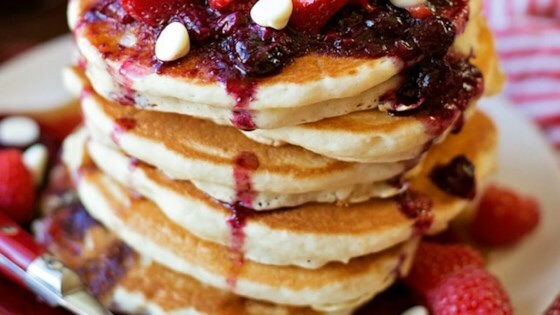 Stack pancakes and serve with syrup, berry sauce, sliced fruit, and additional white chocolate chips, if desired.